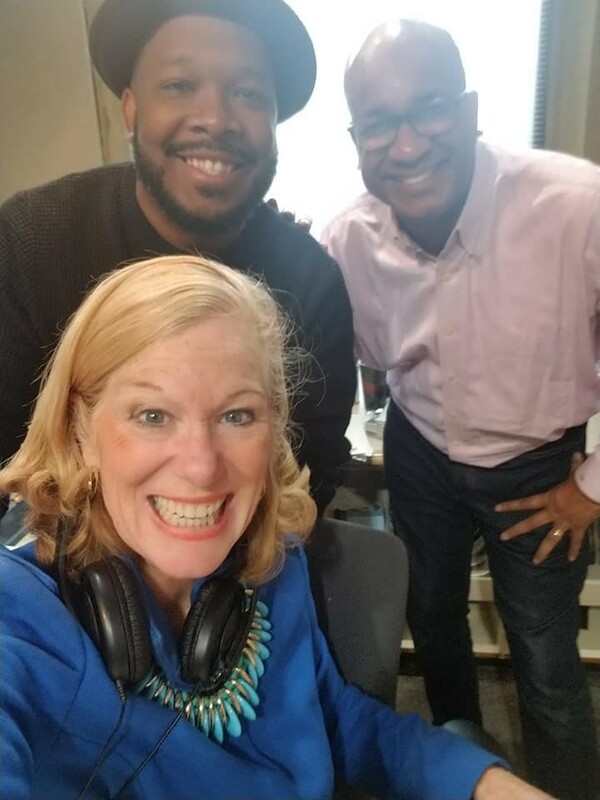 WVGU’s Shelley Irwin talks with the Founder of The Mosaic Film Experience, Skot Welch, along with Hollywood Costume Concept Artist Phillip Boutte Jr. about the 2018 Mosaic Film Experience Event, Phillip’s career path, and words of inspiration for our community’s youth. Phillip Boutte Jr. is a professional costume concept artist who has worked on films such as “Black Panther,” “A Wrinkle in Time,” “Inception,” “Guardians of the Galaxy: Vol 2,” “The Greatest Showman,” “The Hunger Games,” and many more. Phillip earned a BFA in illustration and a minor degree in film production design from California State University. He currently specializes in character development, costume concept art, and specialty costume design. Shelley Irwin: Glad that you are here, and I know you’ve been busy in our community as well…introducing a Hollywood Costume Concept Artist – probably wanted to do this when you were five. Phillip Boutte Jr.: Yes! I’ve been drawing since I was little, and I’ve definitely wanted to draw characters for motion picture and film and so being able to work on things like Black Panther (and loving those things since I was little) has been a true blessing. Shelley Irwin: Skot how have you melded Phillip into your Mosaic Film Experience plans? Shelley Irwin: Drop some names… you worked on the films such as “Black Panther,” “A Wrinkle in Time,” “Inception,” “Guardians of the Galaxy,” too many more to list. Tell me a little bit more about your resume, Phillip. Phillip Boutte Jr.: My resume is pretty broad. I’ve worked on a lot of films, thankfully, because I work with a lot of Hollywood costume designers. So the process is: they bring me in, we work together, we collaborate, and I am there to support them in trying to figure out what their vision is for the characters. I then take notes, I do research, we look at tons and tons of historical research, and then we conceptualize what these costumes will be for the characters you see on screen. Shelley Irwin: How’d you get to where you are? Phillip Boutte Jr.: I went to San Diego Comic-Con one year after college, and I showed my portfolio to a panel luckily from the Costume Designers Guild Local 892. It was a bunch of costume designers that did stuff like Harry Potter and Narnia. We showed our portfolios, and the next week, one of my friends got hired to go do eight months in Prague to do Narnia two. She called me, and she said this is a real job. So I joined, and then I was able to do my first job, which was The Mummy Three with Jet Li and Brendan Fraser and I’ve been working ever since. Shelley Irwin: So give me an example of what you did for Brendan Fraser. Phillip Boutte Jr.: That job I specifically worked with costume designer Sanja Hayes, and she was the first person to hire me. We worked for six months drawing mummies, Egyptians, concubines, all kinds of stuff… People take it for granted… all of the costumes are designed and carefully thought about; they’re not just things that are bought from the store. We rent things from places like Western Costume Company that’s in Hollywood, and we start to piece together what these things are. My job is to draw the things that are custom or things that are coming out of the imagination to…bring them to life. Phillip Boutte Jr.: Yes, my specialty is making sure that if you are looking at a superhero or even just a plain old evening gown, is to make sure that that character comes across onscreen as best as possible and the start of that is the creation with the costume designer of what the vision is. I am the first kind of wave of that conceptual process: what is this thing going to look like, what does this character look like? The drawings then go to the studio or the director. They approve it and then from there it goes through a whole list of people including ager/dyers, who make sure costumes look like they’re not new, and cutter fitters, seamstresses. It’s a whole department, so my sketch is the initial thing that carries through the whole process. Shelley Irwin: And is Black Panther your most recent? Shelley Irwin: Are the kids blown away here Skot Welch? Shelley Irwin: …Who did Phillip present to? Skot Welch: So the first day, in the evening we showed it to college students from the Mosaic college contest, then Wednesday and Thursday we did Kent ISD and then GRPS. Shelley Irwin: What kind of… educational journey [did you take] or is it who you know? How does it happen? Phillip Boutte Jr.: It’s a mixture of both. I tell students that first what they have to do is study their craft… if you want to do what I do, you have to learn to draw traditionally: oil, watercolor, charcoal, all of those things. Then you build in the digital; you learn to use the tool to try and manipulate so that you can make changes quickly. From there, it is also dependent not just on being good at your job but also being able to speak to people, to be personable, and to network; [You need to] let them know that they can trust you. So those two skills together have really served me well. But it’s also been something that they must have to succeed. Shelley Irwin: What’s next for you Phillip? Phillip Boutte Jr.: I am working on a Netflix show for Mark Millar called “Jupiter’s Legacy,” and it’s comic book based, so I want anyone that’s listening to go out and read the comic and look for it coming maybe next year or the year after. That is my next big thing…. I also did the costume illustrations for Bohemian Rhapsody. Check it out. Shelley Irwin: …Final word of inspiration to us Phillip Boutte Jr? Phillip Boutte Jr.: I really want everyone listening to know that you can accomplish your goals and your dreams. I want you to turn your dreams into goals because that’s how you make them practical and that’s how you accomplish them.